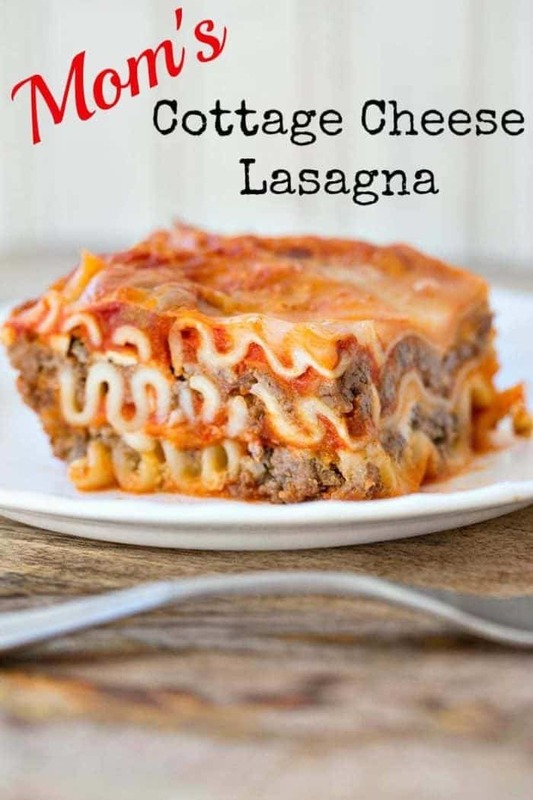 There is nothing I love more than a good ol’ cottage cheese lasagna, which is the best easy lasagna recipe out there. When I was growing up, we lived out in the country and as all country folks know, there’s nothing worse than a run to town when you are out of ingredients. I think that’s why in our household when I was a kid, cottage cheese instead of ricotta reigned supreme when it came to lasagna. We always had cottage cheese for the lasagna. My parent’s house always has a never-ending supply cottage cheese, while ricotta would have required planning out the lasagna and keeping an extra ingredient on hand. When you live a long drive away from the grocery store, you learn to make do with what is in your fridge. 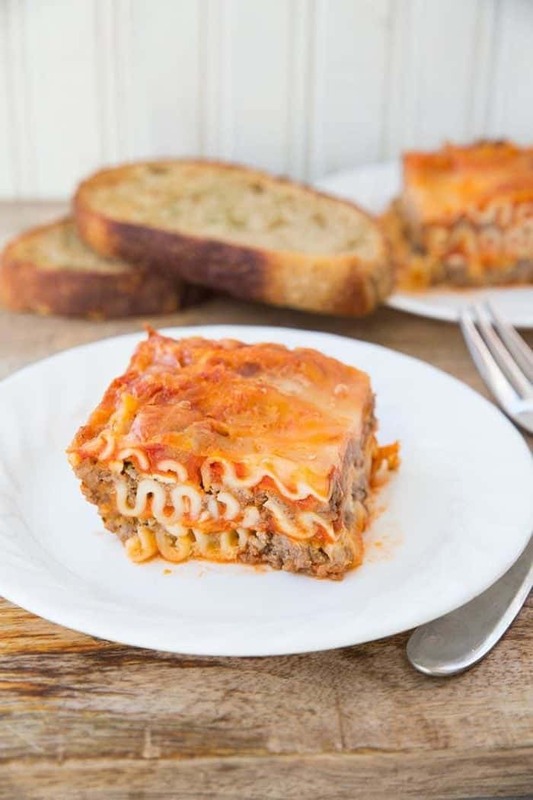 This is a unapologetic ally meat and cheese based lasagna – no spinach here folks. This is pure, cheesy carb-loaded comfort food. Fry up the ground beef and onions together until the ground beef is no longer pink and the onions are soft and translucent. Drain the excess grease and add in the garlic. Saute until the garlic is browned. Stir in the sauce and the water, remove from heat. Combine the cottage cheese, egg and Italian seasoning. Prepare the lasagna in layers of pasta and then the cheese mixture. Cover and bake in 350 °F oven for 45-50 minutes. My trick to making the BEST lasagna ever is to buy a jar of four cheese pasta sauce. This is an awesome retro throwback recipe that uses a jar of pre-made spaghetti sauce and that makes dinner so much easier! Use No Boil noodles, do not use boiled! There is a specific amount of water and sauce in this recipe so that the noodles cook IN the pan without being boiled first. You can add in some vegetables or whatever you like to the meat mixture, as long as they are cooked first. Honestly though this is great just as-is. Baked this at 350 °F for 45-50 minutes. That plus the cottage cheese has made this recipe a family favourite in my household. The four cheese sauce makes it a) easy for you to throw together in a hurry b) extremely delicious c) beyond delicious d) no really, it’s the key here to making the best cottage cheese lasagna. I also put cheese between the layers of the lasagna, as we like a seriously cheesy lasagna. There’s no messing around with little bits of cheese in my house. I know that a lot of people think that making lasagna from scratch is a big production, but making it cottage cheese lasagna and using a jar of canned sauce makes it so simple. To be honest let’s face it, unless you are canning your own tomatoes (and in that case, good on you, I never have enough left over from summer) using a jar of canned sauce is no worse than using a jar of canned crushed tomatoes. Why not make it as simple as you can? Mom’s cottage cheese lasagna IS that simple. Trust Magpie. 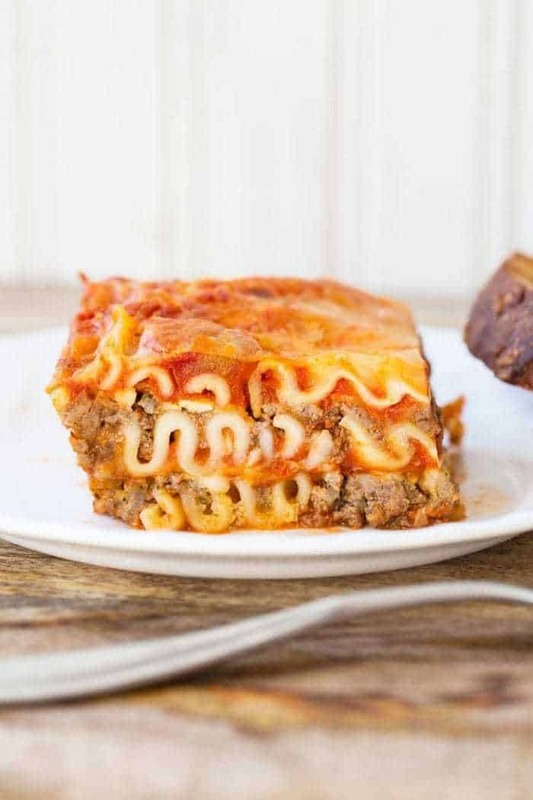 This lasagna is easy enough to make during the week and the leftovers freeze up like a boss. When we were done dinner, I sliced up individual slices and froze them for the kids lunches. I would take one out, defrost and heat it and send it hot in a small Thermos. I have made this three times now and every time it’s a hit – and every time it makes for amazing lunches! Cottage cheese lasagna for the school AND work lunch win! 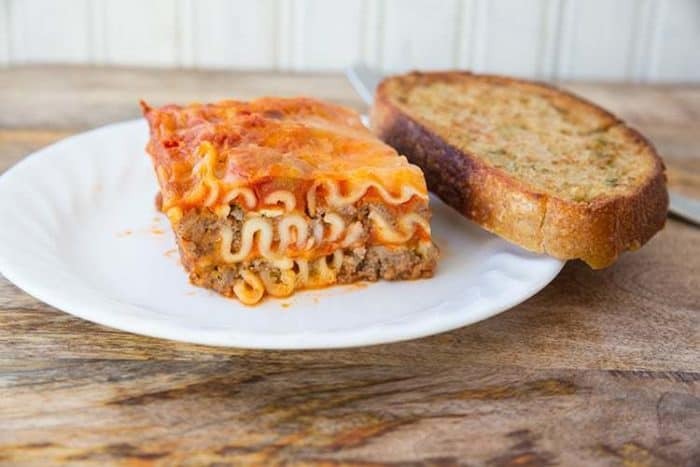 If you really want to get a lot of prep work done, make two pans of this lasagna and slice and freeze one of them specifically for lunches. You could also freeze it whole and warm up in the oven for dinner another night. There’s no reason to buy those gross store-bought frozen lasagna’s ever again, my friends. This is so easy and SO full of cheesy goodness that once you have this, you’ll never buy another one again. Make sure to always keep the ingredients on hand and you’re set. This cottage cheese lasagna is such an easy lasagna recipe! It's the same one my mother use to make and it's my absolute favorite. I think it will be yours too! In a large frying pan, fry up the ground beef and onions together until the ground beef is no longer pink and the onions are soft and translucent. Drain the excess grease and add in the garlic. Sautee until the garlic is browned. In a 9x13 baking pan, spread 1/3 of the sauce mixture on the bottom. Lay three noodles on top. Spread half of the cottage cheese mixture on top of the noodles evenly. Top with a cup of mixed cheese. Lay another 3 noodles on top. Spread out another 1/3 of the sauce on top of the noodles. Spread the last of the cottage cheese mixture on top, followed by a cup of mixed cheese. Cover and bake in 350 °F oven for 45-50 minutes. If you like, remove the cover and bake the cheese on top for another 5-10 minutes to get it slightly crispy around the edges. Remove, let sit for 10 minutes and then slice and serve. This freezes really well and you can double the recipe, and make two. Cover and freeze the other one. To cook just place in the oven covered and cook until the middle reaches at least 165 ° and the lasagna is set, around 70-80 minutes. This is delicious! I also add 1 cup of sour cream and 1/4 cup parmesan cheese to the cottage cheese mix. Adds some creaminess. This lasagna is outstanding. Super easy to make and so good!